Happy residents are loyal residents, but how do you know how they feel? The Customer Satisfaction Score provides important clues to boost your resident experience. Customer satisfaction is critical to the health and growth of a business– but in this relationship era, unhappy residents wield greater power than ever before. An angry tweet, blog post or Facebook rant can go viral in an instant, causing irreversible damage to your property’s brand or reputation. On the flip side, satisfied residents become “brand ambassadors” that promote and recommend your properties to others, increasing renewals and net operating income (NOI). According to Forbes.com, poor customer service costs $338.5 billion globally each year. In the United States alone, that’s about $83 billion. There are obvious correlations between the impacts of a poor resident experiences and lost NOI in real estate. Before now, most operators/managers have focused on building communities and leasing them up. This approach has gradually changed as big-name multifamily companies have started to advocate the importance of excellent resident relations. Aptly is at the forefront of powering incredible resident experiences. Our artificial intelligence powered CRM platform is highly effective at measuring Customer Satisfaction Score (CSAT) and other key performance indicators (KPIs) on agents performance conversation-to-conversation basis. 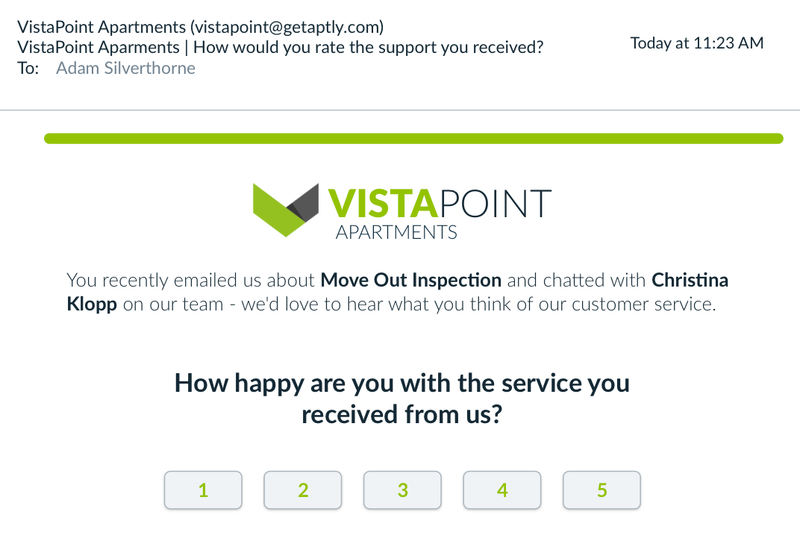 Unlike conventional multifamily survey tools, many of which only generate a few reports each year and do not provide sufficient data for sound decision-making, our surveys are conducted consistently with every interaction a resident has with anyone on your property team. The result is higher customer response rates and feedback you can implement immediately in order to improve the overall resident experience. This method of calculation is called the “top-2-box” measure of customer satisfaction because it only takes into account the two highest possible response ratings: “satisfied” and “very satisfied.” Studies have shown that the two highest values on customer feedback surveys are the most accurate at predicting customer retention. It’s important to understand that all KPI metrics have their pros and cons, and the Customer Satisfaction Score (CSAT) is no exception. However, measuring customer satisfaction allows you to diagnose potential problems, both at the resident and property level, allowing you to catch problems before they spiral out of control and to coach your property staff to improve their performance over time. It’s an industry standard and your residents will completely understand what to do when presented with the question. Make sure your property team acknowledges and thank any residents that complete a survey. This is critical for ensuring that residents will continue to provide feedback — it’s about building trust and showing them value. Engaged residents are loyal residents. With this in mind, it should be your mission to engage them on every level– listening to their feedback, offering them incentives, and keeping them informed each time you address the feedback they’ve provided. Studies show clear links between customer satisfaction and other metrics, such as willingness to pay (WTP) and resident retention. Ask at the right time. Surveys should be done when an interaction is still fresh in a customer’s mind. Waiting too long often results in a lower response rate and the tendency to “rationalize” answers. Quick “emotion” based answers offer the most accurate results. Aptly offers the opportunity for a resident to complete a CSAT survey by clicking a linked included in all outbound emails as well as completing a auto survey sent when conversations are closed. Dig deeper. A good CSAT score does not tell the whole story. Customers may be satisfied regarding a particular service, but that does not automatically mean they are loyal. The CSAT score should thus be viewed alongside other KPIs for a more complete picture. Aptly shows the average CSAT score across your issue types and a resident profiles so you can get a better sense of the sentiment at a particular property or person. Keep residents informed. Keeping residents in the loop shows that you value their input. Aptly makes it easy to see their feedback and respond quickly. The Customer Satisfaction Score is much more than just a number. It is a highly actionable resident-oriented metric that reveals important information about your property and the teams that manage them. Use it to improve resident relations, streamline training procedures, refine services, and – ultimately – to boost your bottom line.